Blind Spot Information System (BLIS®) with cross-traffic alert is a feature that can help detect vehicles in blind spots during normal driving and traffic approaching from the sides when reversing out of parking spots. MyKey® is designed to allow parents to encourage teenagers to drive safely and more fuel efficiently, and increase seat belt usage. The standard MyKey feature allows owners to designate keys that can limit the vehicle’s top speed and audio volume. Easy Fuel® (capless fuel filler) is a standard Lincoln-exclusive feature that uses an integrated spring-loaded flapper door to eliminate the need for a fuel tank screw cap. MKS Lincoln MKS evokes luxury from its exceptional quietness and comfort to its premium materials, class-exclusive features and confident driving demeanor. Lincoln says that Lincoln MKS chassis provides isolation from road noise and harshness but doesn’t isolate the driver from the road. It's powered by an available 3.5-liter EcoBoost engine, that offers a powertrain that offers both economy and performance. New for 2011, music lovers will enjoy the addition of HD Radio technology to the available voice-activated navigation system. The HD Radio receiver enables more listening options and digital sound quality with no additional equipment or cost. To use HD Radio, listeners simply tune in their favorite station. If the station is broadcasting with HD Radio technology, the system automatically picks up the signal and will transition to digital audio once decoded. 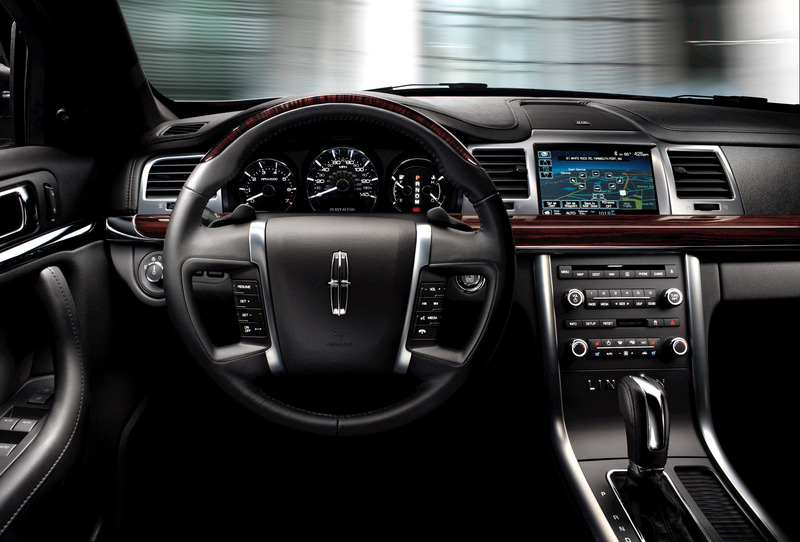 The Lincoln SYNC® voice-activated in-vehicle connectivity system, standard on the Lincoln MKS, now integrates Traffic, Directions & Information with the voice-activated navigation system. Traffic, Directions & Information leverages industry-leading voice-recognition software, integrated GPS technology and a customer’s Bluetooth®-capable mobile phone to provide simple hands-free access to personalized traffic reports, precise turn-by-turn driving directions, and up-to-date information including business listings, news, sports and weather This technology employs an ultrasonic-based sensing system, as opposed to video camera-reliant competitive offerings, making parallel parking a breeze. Active Park Assist activates at the touch of a button, determining an adequate parking spot, detecting the edges of adjacent objects to calculate an optimized angle, and then steering the Lincoln MKS into the spot while coaching the driver through conventional throttle and braking inputs. In addition to completing a parking maneuver quickly, Active Park Assist also works in uphill parking situations, unlike some competitive systems. Also working in conjunction with EPAS, Pull-Drift Compensation is a software-based technology that helps drivers offset vehicle pulling or drifting that can occur in steady crosswinds or on uneven roads. Pull-Drift Compensation uses sensors to constantly measure the steering input applied by the driver to help maintain the vehicle’s path; it automatically compensates for slight steering input changes caused by environmental factors such as road crowning or steady crosswinds. 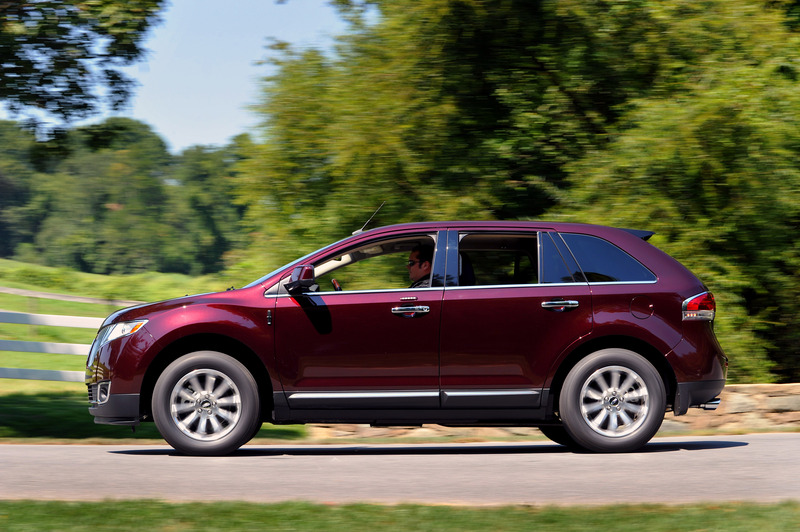 On the road, Adaptive Cruise Control and Collision Warning with Brake Support allows the driver to set and maintain vehicle speed, while radar monitors traffic ahead of the Lincoln MKS. This optional system automatically adjusts speed and slows the vehicle to maintain the set distance behind traffic ahead. Collision Warning with Brake Support provides the driver with a “heads-up” display that flashes on the windshield if the system senses a potential collision with the vehicle in front of it. If the driver doesn’t respond and a collision is imminent, the system will pre-charge the brakes and increase brake assist sensitivity to provide full responsiveness when the driver does brake. MyKey allows parents or other concerned owners to restrict certain Lincoln MKS features when in the hands of a MyKey driver. Parents simply program the vehicle key through the message center to incorporate features such as: Limited top speed of 80 mph Traction control system that limits tire spin cannot be deactivated Audio system volume limited to 44 percent of maximum volume A speed alert chime at 45, 55 or 65 mph Lincoln MKS is offered with two audio technology choices. Standard is a THX® II Certified Car Audio System with AM/FM/CD6/DVD/MP3 capability, 10 speakers, SIRIUS® satellite radio with six-month prepaid subscription, an auxiliary input jack and a USB port. The available navigation system includes an internal hard drive for map and point-of-interest information storage, THX II Certified Car Audio System with 14 strategically aimed Premium Audio speakers and HD Radio technology. In addition, a SIRIUS Traffic™ and SIRIUS Travel Link™ prepaid subscription is included with the navigation system, providing coast-to-coast weather data, forecasts, fuel prices, sports scores, movie listings and more. The available navigation system also enables the driver to display personal photos on the center stack-mounted touch screen. The system can store and display up to 32 photos, sized 1.5MB or less. The home screen can be personalized by display, desired information, or photos in one-, two- or three-panel views. Both audio technology choices feature an internal Jukebox hard drive for storage of up to 150 hours of recorded audio entertainment. Users can browse the Jukebox via touch screen or voice control. Gracenote® technology will display the CD cover when a selected track is playing. Striking interior detail A philosophy of “guilt-free luxury” means Lincoln MKS strives to use materials and processes that reflect the finer things in life, but not at the expense of the world around it. Examples include: Leather for the seats by Bridge of Weir, the same Scottish company that supplied hides for the iconic Continental Mark II, was chosen for its high quality and its organic, chromium-free tanning Ebony wood, used for some models, is reclaimed from furniture makers and other sources to offer a beautiful and rare wood with minimal environmental impact Lincoln comfort seats, developed for the MKS, feature side bolster supports designed for spirited driving. The standard heated and cooled 12-way power driver and front passenger seats offer four-way lumbar (up, down, inboard and outboard) for added comfort on long trips. 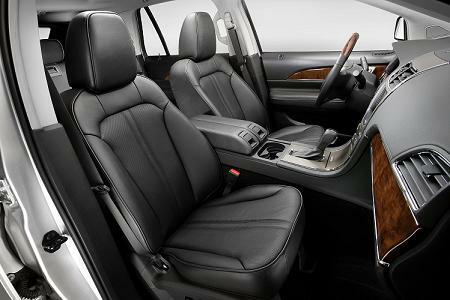 Rear seat passengers also enjoy a luxury experience as they enjoy standard heated rear outboard seats. Recessed into the front and rear door openings, cleverly designed hidden rocker panels allow for a low step-over height, making it easier to enter or exit the vehicle. This design helps shield the rockers from the elements, reducing the likelihood of soiling shoes or trousers when entering or exiting the vehicle. Balanced power, boosted efficiency For an even more performance-oriented driving experience, Lincoln MKS also offers an available 3.5-liter EcoBoostTM twin-turbocharged, direct-injected V-6. This engine provides 355 horsepower at 5,700 rpm, while generating 350 ft.-lb. of torque from 1,500 through 5,250 rpm (using premium fuel) – all while returning an EPA-estimated 17 mpg city/25 highway with AWD. The unique combination of power and efficiency also makes the EcoBoost MKS the most fuel-efficient all-wheel-drive Lincoln MKS available, topping the naturally aspirated AWD model by 1 mpg city and 2 mpg highway. Pressurized direct injection enables a higher compression ratio, while twin turbochargers work in tandem to reduce lag associated with earlier turbocharged engines. Even with additional horsepower, fuel economy is optimized by an increased compression ratio – enabled by charge-cooling air – and sophisticated knock controls. 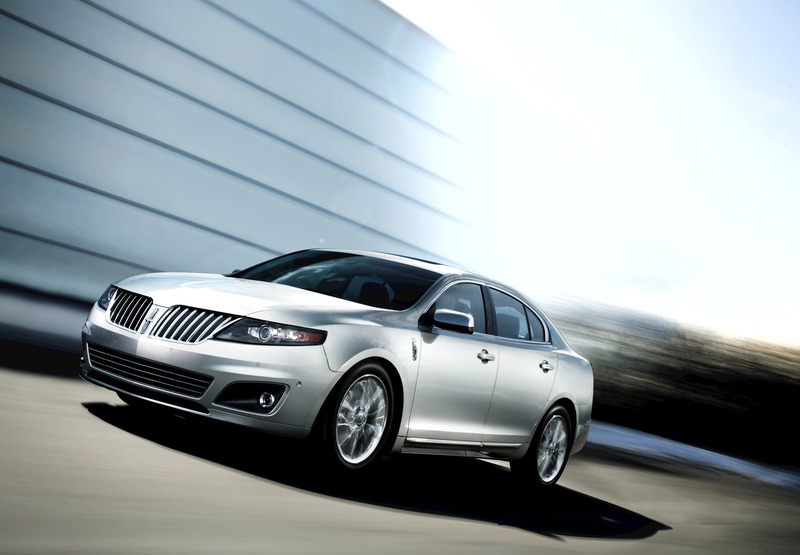 Lincoln MKS is equipped with a six-speed SelectShift Automatic™ transmission with paddle shift activation. The gearbox offers the driver a choice between fully automatic operation and manual control. In addition, paddle shifters are integrated into the steering wheel spokes. Intuitive to operate, a squeeze back on either paddle will deliver an upshift, while a gentle push forward on either paddle will induce a “matched-rev” downshift.